You must have been living on the Moon if you think you don’t need to create an eCommerce website. In the digital age, when time is money, people used to do shopping on the web. Truth is, online shopping is gaining popularity among all ages. When you have a business that strives for complete satisfaction why wouldn’t you want an eCommerce site that does the same? Why not? Make no mistake, an eCommerce website to strengthen your advantage. Welcome to the club. The bad? Who knows where to start? Don’t fret. Brace yourself to learn the easy way to create an eCommerce site up and running in a minute. Selecting a template out of several eCommerce themes for your new business might be the first step to creating an online business. eCommerce has grown to become the second widely used website category. Online stores make it easier for people to find specific things they needed. In the new economy, social media networks such as Facebook, Instagram and others let people see what products their friends are buying. For merchants, for instance, it helps to get the word about their products. In its turn, potential customers gain exposure to products they might not be aware of. You’ve got the point. So, What CMS Platform Is Better? For this reason, we want to encourage you to create an e-Commerce website and a brand value. Let’s say, there’re plenty of content management systems (CMS) allowing create a hassle-free e-Commerce website that looks attractive, professional or at least decent to look at. These are WordPress, OpenCart, Magento, PrestaShop, and more. Which one is better? It’s not that easy, in fact. It depends heavily on your particular business needs and your delicious tastes. Context matters. Each of these main players offers a fantastic set of customization tools, advanced features, custom plugins and widgets to make your website shine. The best thing about these eCommerce platforms is that they are all free to use. There are various things to consider when choosing the right CMS platform to create an e-Commerce website. Let’s say, Magento as the premier eCommerce platform offers tons of features, many of which aren’t available on other platforms. That is, managing of multiple stores, multilingual and multi-currency options, both the backend and front-end features to improve administration options, and more. 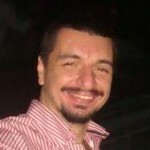 People choose PrestaShop for its ease of use, simplicity, lightweight, and intuition. For example, developed with users in mind, OpenCart is a multifunctional, easy-to-use and a user-friendly solution for small and middle sized online stores. Let’s dive deeper in. Anyway, there’s no equally good solution for anyone. Keep your eyes open. Find the problem and build the solution. To help you to do this, learn more about some free eCommerce templates below. As you plan or just dream about your online store, we invite you to get inspired by these eCommerce themes from TemplateMonster to develop your own ideas. Make your pick and use it to your full advantage. 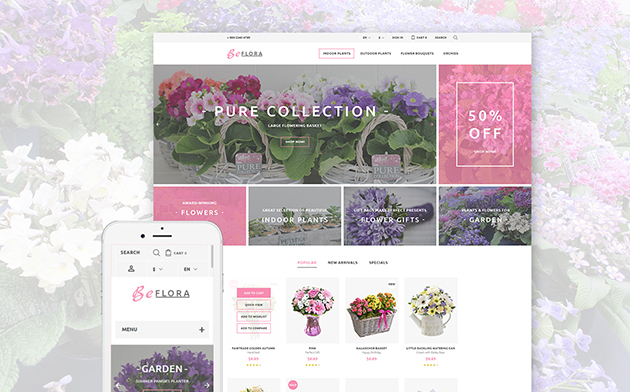 Let’s start from BeFlora – Free FlowerShop PrestaShop Template which is a great option for a flower store. Designed in fresh colors, the template comes with some advanced features you may need to make your online store shine. With the help of Mega Menu Module, you can tweak the layout of the homepage with minimum time and effort. In addition, it is multilingual and multicurrency, so you can gain a worldwide popularity quicker. Ajax search allows finding only specific items your visitor is looking for. What’s more, the template is responsive, cross-browser compatible and well coded. BeFlora can be a good starting point for your modern online store. 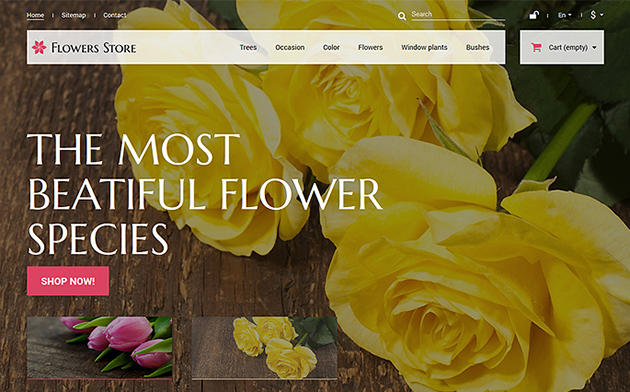 By way of example, you can check out premium Flower Store PrestaShop eCommerce Theme for your project. This elegant, responsive and SEO-friendly flower template developed with a simple idea to help you launch your online store quicker. It features responsive design, product labels, list/ grid category view, back to top button, a Commenting system, social options, a Newsletter subscription, and much more. Click the live demo to learn more about a free 24/7 customer support that comes with this premium template. Keep your website clean and simple to attract natural traffic. 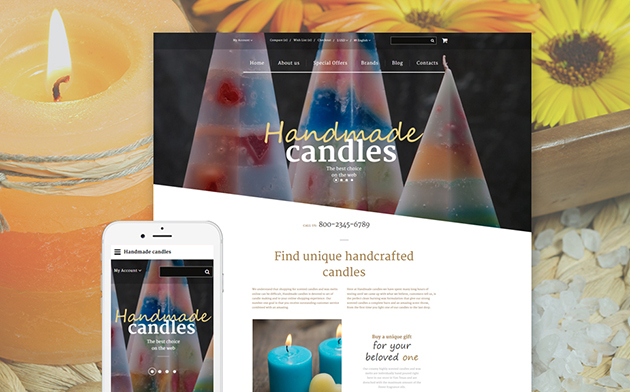 Handmade Candles – Free Souvenirs OpenCart Template can serve as the foundation for a souvenirs or handmade products online store. It looks nice and elegant to represent your brand or company in the best light. Build a customer-friendly site to get the most traffic possible. The template is responsive, cross-browser compatible, multilingual, and easy to navigate. Give your visitors a reason to do online shopping with your brand. Definitely, one to try. You can easily save your time and choose a premium solution to stay on the safe side. 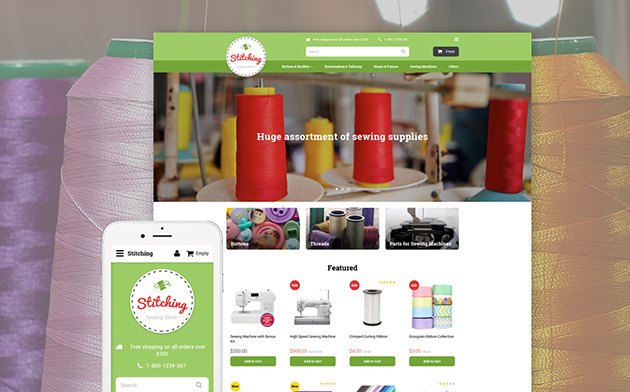 Choose Stitching – Sewing Store OpenCart Template to not regret the money spent. With this template, you can build a consistent website compatible across all modern devices and screen sizes. Stick-to-top-menu ensures you visitors will find what they’re looking for in the simplest possible way. Parallax effect will capture the attention of your prospects and present your brand in a more engaging way. Tweak the layout of the theme with ease to match all your particular needs and tastes the best. Intrigued? Click on the image to see a live demo. 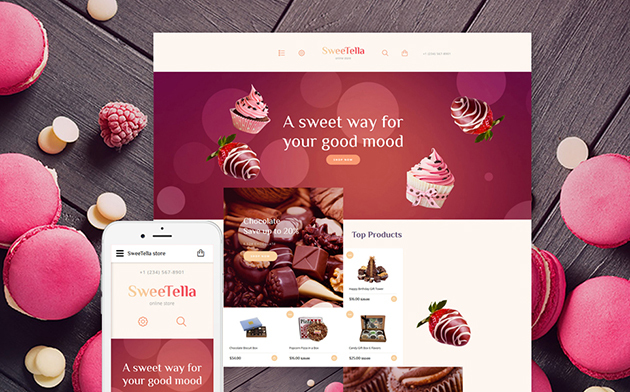 SweeTella – Free Sweets Store OpenCart Template is a nice solution for your candy, beauty or gift online store. The template is responsive, so you can generate more revenue and maximize your profit. A simple good-looking OpenCart template with multiple customization options is a great choice for your modern and easy to use website. Make any changes you wish to advertise your candy store and see how successful you can become with it. Fear not to make it bright to drive sales and revenue to your brand. See for yourself by clicking on the below image. 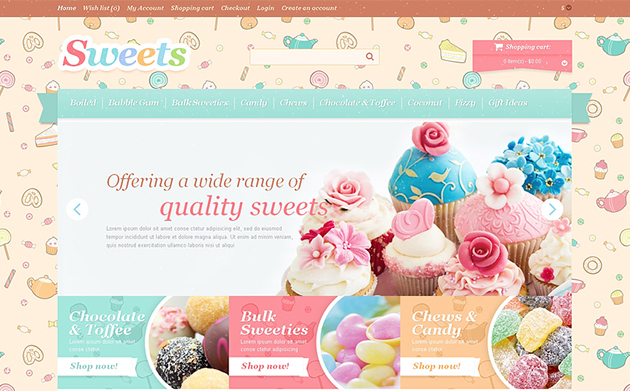 If you want your online store to stand out, choose premium Sweets OpenCart Template among premium eCommerce themes. The fully responsive design of this template will help you eliminate the difference between the real shop and online one with the high-quality images of your products. The template looks great and works excellently to deliver an amazing user experience to your customers. Definitely, worth your time and money. Build a customer-friendly online store and watch the visitors come. Online shopping is gaining speed, so build clothes online store with this ClothesStore – Free Magento 1.9 Template in a minute. Designed with a clean, responsive and attractive layout, this template will work for your business as well as it possibly can. A set of powerful features, Parallax scrolling, full-width sliders, background video, and more. This will be one of your favorite eCommerce themes. Customize the template to fit our delicate taste. In addition, it comes with a Contact form, Newsletter subscription, SEO-optimization, cross-browser compatibility, etc. What more could you ask for? Try it. 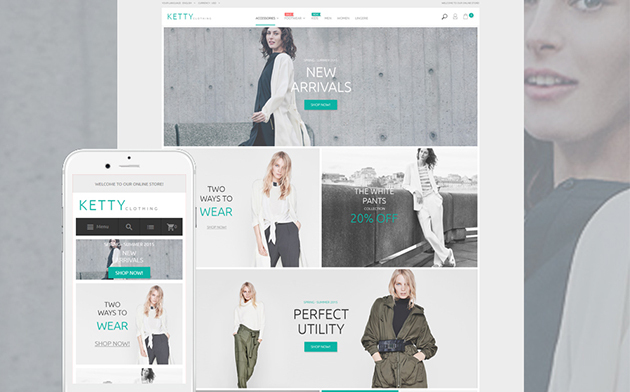 Create a unique piece of web-art with the premium Ketty – Fashion Store Magento Template with no effort. When a visitor will land on your site, make that mission crystal clear. Bear in mind, appearance does matter. Guide your visitors throughout your clean, attractive and modern site and encourage them to take actions that benefit your business. With the background video you can show off your unique products and services in some welcoming way. Build a blog and let the world to draw in and engage your brand. Help your beautiful fashion store site pop up in the viewers’ search engine results. By choosing Ketty from a portfolio of several eCommerce themes, you may have a chance to make the best use of an SEO-friendly and impressive website. All in all, it’s up to you what CMS platform to choose for your eCommerce website. What’s more important to create a clean, simple and eye-grabbing online store that doesn’t make your target audience think. People are always ready to buy at different times and for different reasons. So, it would be in your own interest to accept this and stay on top of mind with your prospects until they decide that they need to buy what you offer. By the way, TM Service Center can help guide your efforts when creating an eCommerce website. Magic happens when you choose the right way to sell. Now what? Make your pick and become a global player. Best of luck! “How to Create an eCommerce Website – Free vs. 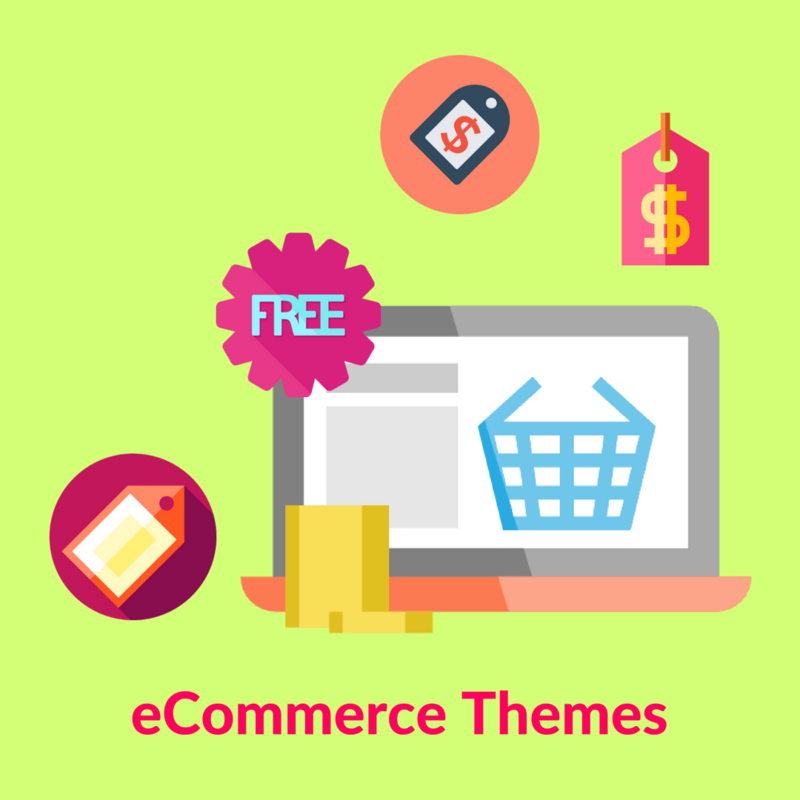 Premium eCommerce Themes” is a guest post from Allison Reed. Allison is a professional writer and marketing specialist contributing for most famous vendors like TemplateMonster. (the team behind My Template Storage; the worldwide template affiliate program.) 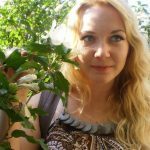 She is an affiliate manager by day and a writer by night, she is creating many articles on business, marketing, design and web development. 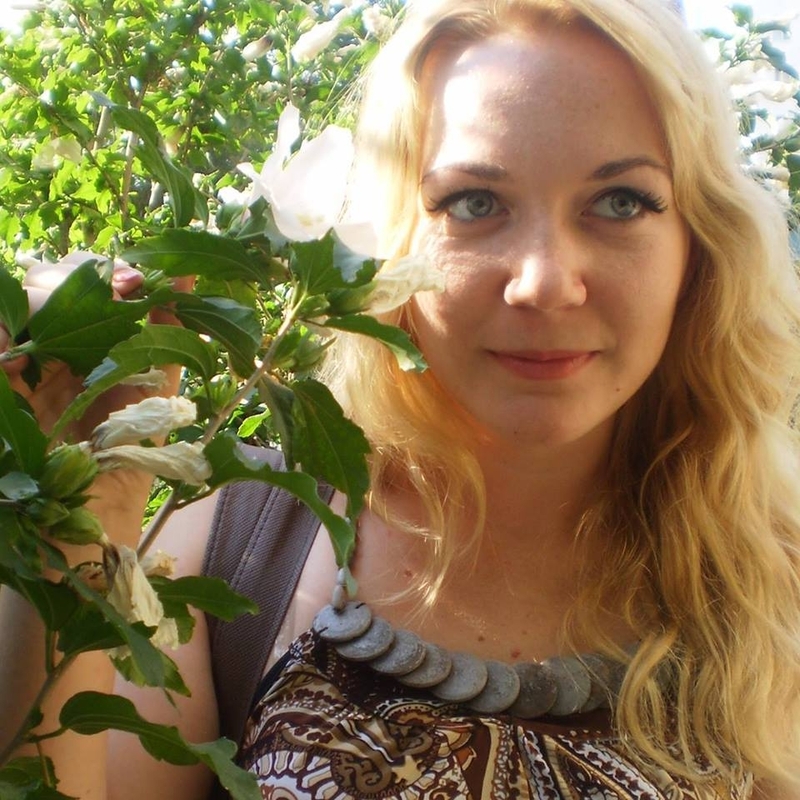 She loves working with WordPress and sharing her experience with the readers.